By now you’ve heard of Kidtoons, right? Kidtoons is a small organization dedicated to bringing fun, affordable, safe family oriented programming to movie theaters nationwide. There is a new family friendly movie every month with related activities like coloring contests, book recommendations, giveaways and related activities. You can also sign up for the weekly newsletter for the activities and information on the films. Matinees run every weekend… what a great way to get your children acclimated to a movie theater! Kidtoons is proud to present: Spookley the Square Pumpkin. October is National Bullying Prevention Month and Spookley the Square Pumpkin has been named the official Spokes-Pumpkin through a partnership with PACER Center. PACER, a national organization based in Minneapolis, Minn., works to expand opportunities and enhance the quality of life of all children and young adults, including those with any disability, and their families, based on the concept of parents helping parents . "The culture of bullying won’t end until people across the country take action and show children and teens that they care," says Julie Hertzog, director of PACER’s National Bullying Prevention Center, which sponsors the month. "We love the way Spookley touches the heart and the mind with his message of tolerance and acceptance." In a world where "the only good pumpkins are round pumpkins," Spookley the Square Pumpkin is often teased by the other pumpkins because of his square shape. Soon, Spookley is befriended by Edgar, Allan and Poe, three hilarious spiders, who convince Spookley that, square or not, he has a right to be the "Pick of the Patch" on Halloween. A square pumpkin the "Pick of the Patch"? Not if mean round pumpkins Big Tom and Little Tom can help it. These two bullies tease and taunt Spookley because of his square roots. Although he is encouraged to continue to become the "Pick of the Patch" by kindly Jack Scarecrow and his bat sidekicks, Boris and Bella, Spookley isn’t sure he has what it takes until a mighty storm threatens to destroy the entire patch. As the storm rolls the round pumpkins across the patch towards a raging river below, Spookley’s square shape helps him save the day. Spookley realizes "it’s fine to be round while the weather is fair, but there are times it’s better to be a square!" This giveaway ends at 11:59 PM EST on October 18, 2011. Disclosure of Material Connection: I only recommend products or services I use personally and believe will be good for my readers. I am disclosing this in accordance with the Federal Trade Commission’s 16 CFR, Part 255: “Guides Concerning the Use of Endorsements and Testimonials in Advertising.” The opinions expressed in this post are entirely my own. Your experience with the product may differ from mine. The sponsor is responsible for prize fulfillment and will be shipping the winner(s) their prize(s). For more information read my disclosure policy. I just love that the different pumpkin is so good. In reading about this on the web site I think it teachers that not everyone being the same is a bad thing! i love the coloring contest!! my son is big into coloring right now he would love that!! i might have to print off the coloring pages for him to color!! my kids would love the coloring contest – how fun! I learned that for every DVD sold a donation up to $0.50 will be made to Starlight! I like their games section. Thanks! I didn’t know they had a coloring contest. Very cool! My kids would love “Scooby-Doo: “Where’s My Mummy. Anything to do with Scooby-Doo. I love Spookly the Square Pumpkin! I like that they offer reasonably priced movie tickets so that families can go to the movies! I love the coloring contest!!! Also the the fact fact that they are teaching the fact that it’s ok for everyone to be different. I like the printable coloring sheets! I like the coloring pages you can print. I learned that Spookly the Square Pumpkin is playing at a theater near me! I signed my boys up for their birthday club too. I like all the different activities for the kiddos on the website. We LOVE this movie. I DVR’d it last year and we have watched it all year. Thank you! I love that they have a Birthday Club! I signed up my son, can’t wait to see what offers they have! The coloring pages are also pretty cool. My son will love the coloring contest! Boo Hoo…no locations in my state…I did download the apple coloring sheet. My daughter will love the Spookley coloring page. I like the birthday club. I learned they have coloring pages and a coloring contest going on. I’ve learned that they have a birthday club. I like the coloring pages in kidtoons. I LOVE the coloring sheets! I like the kid’s birthday club they have, such a cute idea! I like the Dr. Donna reviews. I learned that Kidtoons is dedicated to helping parents connect with their kids by bringing family friendly animated movies to the big screen every weekend at participating theaters across the country. I learned that as part of making sure that the content is age appropriate, they asked an expert, Dr. Donna Mitroff, to talk with parents about the movies each month. I really like this idea. Thanks for the giveaway! I like that the website provides detailed information on the about the film so that a parent can decide whether the movie is age appropriate for their child. I learned that Dr. Donna posts suggested discussion questions on the website to help parents talk to their kids about the Kidtoons movies. What a great idea! I like the coloring pages! Loving the coloring sheets. Those are huge with the children I care for! I learned that it’s okay to be different! I love the activities for the children. I love the coloring pages and printed them for my son! I learned that they have a birthday club, and if you sign up for it you can recieve special gift coupons on you and your child’s birthdays. I like the birthday club they have. I like that they posted printable coloring pages. I learned they have a birthday club offer! I learned there are no theaters around here. That makes me sad. I like the spookley coloring pages you can download. I love the coloring pages that you can download each month! I learned that you can sign up for there birthday club. I learned that the closest theater to me is in Buffalo, NY, and that they have some great coloring pages to print on their site! I learned there is a location very close to my house, if only my granddaughter was here also. I learned that they have cartoon shorts, music videos and sing-alongs before each movie. They show these in theatres…but none by me! I learned that Kidtoons is having a coloring contest. I am going to have my three boys enter it. I love the coloring contest at Kidtoons! The coloring contest is neat! I like that they have a Birthday Club. Those are always fun for the kids! I like the coloring contest. 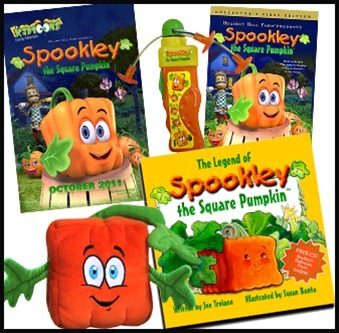 I love the Spookley pumpkin and would love the DVD. I like that he’s not a scarey looking pumpkin, but a friendly one. I follow your blog on GFC, subscribe to your email and like you on Facebook! I would absolutely love to win this for my son! I learned they have coloring contests! Thanks so much for the fantastic giveaway! I liked reading Dr. Donna’s review of the movie. I am happy that there is a movie for children with the very important theme of understanding individual differences and the value of one’s own uniqueness. They are having a coloring contest! I like their coloring pages. Thanks for the chance to win! I learned that they have a birthday club where your child can get a free movie ticket. The coloring pages are fun! the coloring contest is awesome! I learned about their birthday club. I learned they are having a coloring contest! There are no surprises in Kidtoons features. Parents are provided with detailed Information about the film content on the website. As a parent, you can make decisions about each film based on the age and personalities of your children. I really like the theme of this show, it’s ok to be different and can be advantageous! I did not realize they play movies in theaters but there is none close to us. Love the coloring contest. Oh, shoot! Submitted w/o the coloring pages aspect! I apologize. That was a treat to find and I’ll be printing them out this week! I like the coloring contest! I love the activities for the children and the birthday club! I learned that they have fun giveaways for the kids after the films in the Kidtoons theaters! The spiders in this movie are named Edgar, Allan and Poe! We love Spookley! We just saw the movie the other day! I learned that they currently have a coloring contest going on. Cool! I love the coloring contest. We like the coloring sheets, their great! I learned that the kidtoon movies were shown in movie theaters on saturday and sunday for a family friendly option. We signed up for the birthday club. I learned that the closest theatre to my home is in Kennewick WA. I learned about the Birthday Club and Coloring Contest!!! I learned they have coloring pages that I printed for my little girl! Cute site! 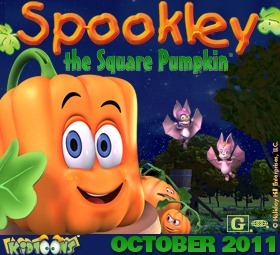 I love the spookley square pumpkin. I learned they have halloween pictures you can print out for coloring. Thanks for having the contest! I learned that they have activities for kids.